The smartphone integrated high-resolution complementary metal-oxide semiconductor (CMOS) sensors have been widely exploited to detect optical signals, relying on colorimetric, fluorescent (FL), and bio-chemiluminescent detections. In the last 5 years, there has been an exponential increase in the publications on the use of smartphones as stand-alone bioanalytical devices. Conversely, the use of smartphones to detect cells and cell biosensors has been seldomly explored. In this chapter, we will review the smartphone potential as portable detector, and we will provide an overview on the state-of-the-art of using smartphones to detect cells and cell biosensors. Major research trends, open issues, and limitations are also addressed to provide the reader a glance on this challenging research trend. A recent estimate of the International Telecommunication Union 2018 reports a continuous upward trend in the access of information and communication technologies with a number of mobile-cellular telephone subscriptions that has now surpassed the total population (https://news.itu.int/itu-statistics-leaving-no-one-offline/). It goes without saying that the availability of such disrupting technology provides an incredible potential especially for healthcare self-management and other markets. Smartphones can be considered a sort of evolution of the point-of-care (POC) concept. Several features of the smartphone can be exploited including processing power, camera, connectivity, enabling to perform tests outside laboratories. The smartphone integrated high-resolution complementary metal-oxide semiconductor (CMOS) sensors have been widely exploited to detect optical signals, relying on label-free, colorimetric, fluorescent (FL), and bio-chemiluminescent detections. In the last 5 years, there has been an exponential increase in the publications on the use of smartphones as “all-in-one” bioanalytical devices. The continuous improvement of the smartphone electronics together with the availability of new apps turned smartphones into biosensors. 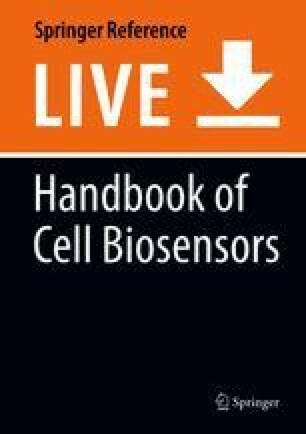 In this chapter, we will review the smartphone capabilities and compare them with portable detectors and an overview on the state-of-the-art of using smartphones to detect cell biosensors and cells will be provided. Major research trends, open issues, and limitations are also addressed to provide the reader a glance on this challenging approach. where σd2 is the variance of shot noise, q is the charge of an electron, Id is the amount of dark current, and Δf is the electronic bandwidth of the sensing system. The implementation of cooled systems into portable devices is not straightforward, since additional components are required to avoid water vapor condensation on the camera window and also a larger power supply. The feasibility of using different portable CCD cameras as low-light detectors has been reported by cooling the sensor with a Peltier chamber down to −10 °C. This approach enabled the detection of different types of cells including magnetotactic bacteria and yeast; however, these approaches still require an external computer to handle the images and elaborate the signals (Roda et al. 2011, 2013). A very recent comparison of different smartphone cameras was reported by Kim et al. together with an imaging-processing algorithm providing improved sensitivity of the smartphone cameras for low-light detection (Kim et al. 2017b). They compared five types of Android and iOS smartphones to measure the bioluminescent reporter Pseudomonas fluorescens M3A, and OnePlusOne provided the best performance with a limit of detection of about 106 colony forming units (CFU)/mL. Recently, the implementation of smartphone-based platforms is appearing as a valuable tool to detect cells for diagnostics, food analysis, and forensic applications. However, there are very few reports of smartphone-based platforms that use cells as a sensing element. Living cells are a versatile platform for biosensing. They can be engineered to express biorecognition elements for several classes of analytes. Smartphone-based fluorescent (FL) devices have been developed both for qualitative and quantitative analysis of biological molecules. Thanks to the high potential sensitivity of photoluminescence and the availability of many FL dyes with different spectral properties, fluorescent biosensors provided valuable tools for multiplexed analysis. Conversely, these biosensors require an external excitation light source and the measurement cell is strongly influenced by specific parameters in terms of geometry and transparency. An interesting application of smartphone-based imaging platforms is related to bacterial detection for various infectious diseases. Bacteria detection is generally time-consuming and requires skilled personnel and centralized lab facilities, so the availability of a mobile platform for rapid diagnostics would be highly valuable. However, there are very few reports of fluorescent smartphone-based platforms to detect living cells. The first smartphone-based FL biosensor was developed in the 2012 by Ozcan’s group (Zhu et al. 2012) to detect Escherichia coli cells in liquid samples. A capture anti-E. coli 0157:H7 antibody was immobilized into a glass capillary support and a detection antibody labelled with a specific quantum dot was used for detection via LED light excitation (Fig. 1). An additional optical lens was inserted between the capillary and the smartphone camera for the acquisition of the FL signals. This cell phone-based fluorescent platform provided a detection limit of ∼5–10 CFU/mL in buffer solution and good performance also in complex food matrix such as fat-free milk samples. The same research group (Zhu et al. 2013) reported a multipurpose blood analysis smartphone microscope to measure the density of red and white blood cells and hemoglobin concentration in human blood samples. Images were processed and analyzed using a custom-developed app. Cell density or hemoglobin results were obtained within 10 s and could be stored on the smartphone or sent to a remote server for further analysis. These results were comparable with a standard commercial Sysmex KN21 hematology analyzer showing a 7% leukocyte counting error, a 5% erythrocyte counting error, and a 5% hemoglobin concentration measurement error. Fronczek et al. reported a smartphone-based protocol exploiting a paper microfluidic chip to detect Salmonella typhimurium in real poultry samples (Fronczek et al. 2014). In particular, the lysed sample was loaded on paper microfluidic chip able to extract FL genomic nucleic acids (DNA). A miniature FL microscope comprising two bandpass filters, two 10× objective lenses, a dichroic mirror, and a blue LED was assembled to an Iphone 4 camera for FL reflectance measurements. Cellulose paper was used for analyzing low and high concentrations of pathogen DNA while nitrocellulose paper for the mid-range concentrations obtaining a LOD of 103 CFU/mL and 104 CFU/mL, respectively. The use of two different papers in different channels for quantifying different concentration range makes the procedure relatively complex. Another approach to detect food-borne bacterial pathogens Salmonella and E. coli 0157 was developed by Rajendran et al. (2014). Exploiting an alternative immunoassay format, the authors reported the use of silica nanoparticles doped with fluorescein isothiocyanate and Ru(bpy), conjugated to the respective antibodies. A smartphone-based fluorimeter, consisting of a simple optical module attached to the smartphone camera, was used for the acquisition of FL signals. Without any pretreatment of the sample, the device was able to detect pathogens at levels of 105 CFU/mL. A microfluidic device coupled with a smartphone microscope was developed by Hutchison et al. (2015) to detect Bacillus anthracis spores, monitoring the entire growth process. Another example was reported by Shrivastava et al. for detecting S. aureus (Shrivastava et al. 2018). The smartphone microscope included a white LED, a 10× objective, and a dichroic mirror to excite the fluorescently labelled bacteria. The procedure consists to label the target bacteria by Sap-FMNPs, a S. aureus-specific aptamer (Sap) covalently attached to fluorescent magnetic nanoparticles (FMNPs), and successively load the cells into the bacterial detection cassette. Fluorescently labelled bacterial colonies were imaged with the smartphone microscope and analyzed with an external computer. The analytical performance of this system was compared to that obtained with conventional plate counting methods and showed promising results with the possibility to quantify a concentration range of 50–2000 CFU/mL of S. aureus cells. Apart from these examples in which the smartphone is used to detect pathogens and cells as targets, another important area of research is related to the smartphone detection of cell biosensors; however, very few examples have been reported in the literature. In 2015, Mora et al. reported a smartphone-based fluorescent cell biosensor to quantitatively detect lactose and galactose in food products (Mora et al. 2015). In particular, living material-based analytical sensor (LiMBAS) composed by E. coli genetically engineered with a fluorescent reporter gene under the control of the T7/lac promoter and immobilized in polymeric matrix membrane was used to detect diffusion behavior of chemical stimuli under a blue-light source and a specific blue-light optical filter. Images were taken with a smartphone camera and analyzed with a suitable smartphone application able to calculate the analyte concentration. The proposed biosensor showed a good stability, at least 7 days at 4 °C, and a working range of 1–1000 mM for both lactose and galactose using a sample volume of 1–10 μL. The implementation of bioluminescence (BL) in smartphone-based analytical platforms has been less explored in comparison to fluorescence detection. The main advantages of bioluminescence such as no need for external light source, zero background and high signal-to-noise ratio are counterbalanced by very weak signals. Therefore, BL detection generally requires highly sensitive instrumentation such as PMTs and cooled CCDs. Nowadays, thanks to the availability of several luciferase variants with improved emission properties, such as increased intensity, glow-type kinetics, and emission at different wavelengths (from 460 to 615 nm), it is possible to implement assays into portable formats using less sensitive detectors. More recently, BL has been used in smartphone-based assays for several applications. Thanks to the increasing accessibility of smartphones with high-performance sensors and the availability of several bioluminescent proteins, the landscape of point-of-need analysis has been completely reshaped. The first application of a smartphone to detect analytes in biological samples using BL coupled with biospecific enzymatic reactions was reported in 2014 by Roda et al. (2014). As proof of concept, bile acids were detected using three enzymes (3α-steroid dehydrogenase, NADH/FMN oxidoreductase, and bacterial luciferase) co-immobilized on a cellulose disk. This demonstrated the versatility of this approach for analytes that are present in sufficiently high concentrations. The implementation of enzyme reactions into smartphone platforms is relatively easier than integrating living cells into these devices. In fact the first report on implementation of BL cell was published in 2016, relying on the integration of human cell lines used as “sentinel cells” into a smartphone-based platform with 3D-printed cartridges (Cevenini et al. 2016b). This toxicity cell biosensor was based on genetically engineered Hek293 cells, constitutively expressing a green-emitting luciferase and integrated in a 3D-printed device. This portable device includes all chemical reagents and droppers for the addition of sample and BL substrate and, thanks to the custom designed Tox-App, provides a stand-alone platform for user-friendly quantitative toxicity testing. The 3D-printed smartphone adaptors result in a very versatile approach thanks to the possibility to be easily produced at low-cost and designed for any kind of mobile device. To improve cell viability during cell storage, future works will be focused on the immobilization of mammalian cells into suitable biocompatible matrices or on the use of alternative eukaryotic cell-lines which are less demanding in terms of culturing condition (e.g., trout cell lines). In addition, as direct 3D printing of living cells is an emerging approach for regenerative medicine and in vitro drug-screening and toxicology applications, the use of “bio-inks” (Ferris et al. 2013) could be also applied to enable a direct and robust deposition of “sentinel cells” into 3D-printed devices for the development of integrated biosensors. The authors believe that this kind of cell phone biosensor could find many applications as rapid alerting tool for detecting the presence of harmful pollutants in civil and military water supplies, for terrorism surveillance, and for detection of health threats in drinking water in developing countries. Currently, there is nothing like this validated biosensor available in the market and it could represent a turnkey solution for rapid, sensitive, portable toxicity sensor taking into consideration that huge efforts will be required to extend the lifespan of the integrated cells and to improve their responsiveness to reduce the time-to-response signal (Cevenini et al. 2016). In the same year, a more efficient BL system by combining a novel imidazopyrazinone substrate (furimazine) with a new luciferase (NanoLuc) was reported by England et al. (2016). The authors used a blue-emitting luciferase from the deep-sea shrimp Oplophorus gracilirostris, which produces a reaction that is 100-fold brighter than firefly luciferase. Exploiting the highly sensitive NanoLuc luciferase as reporter Cevenini et al. 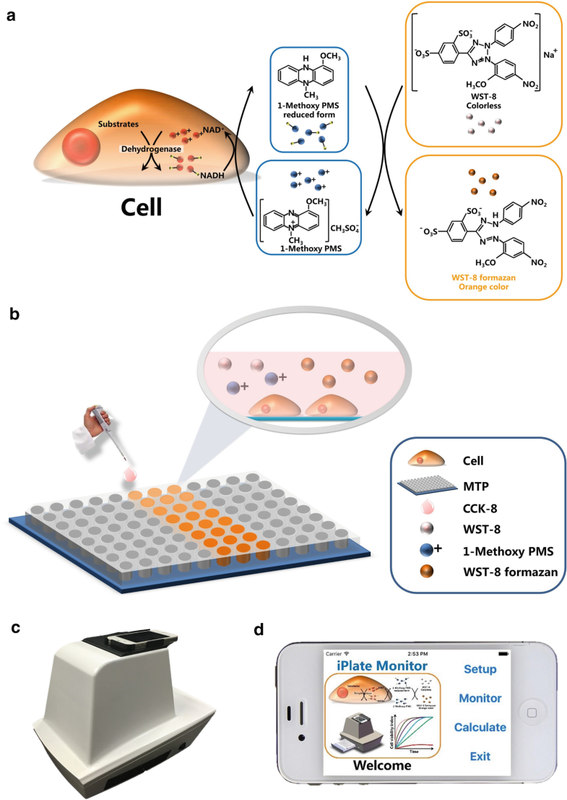 developed a 3D-printed bioluminescence smartphone-based cell biosensor for quantitative assessment of (anti)-inflammatory activity and toxicity of white grape pomace extracts. This cell phone biosensor was based on genetically engineered Hek293T cells. One of the most peculiar features offered by cell biosensors is that they provide quantitative information about the actual biological activity of analytes present in a sample. Indeed, living cells are able to respond either to the fraction of analyte that is able to enter into the cell and interact with intracellular molecular targets as well as to analytes that bind to specific membrane receptors activating signaling cascades. The use of mammalian cell lines is particularly attractive since they represent a better model of human physiology, providing more predictive biological information (Michelini et al. 2014; Class et al. 2015). To obtain bioluminescent cell biosensors, a synthetic DNA construct in which the expression of a luciferase is under the control of a promoter is introduced into the cell. This promoter can be constitutive or regulated by response elements activated by specific receptors upon binding with target analytes (Raut et al. 2012; Michelini et al. 2008). Thanks to NanoLuc’s small size (19 kDa) and the absence of posttranslational modifications, the synthesis and folding of the reporter enzyme was rapid, reducing the assay time. Quantitative assessment of (anti)-inflammatory activity and toxicity of liquid samples was performed with a simple and rapid add-and-measure procedure. White grape pomace extracts, known to contain several bioactive compounds, were analyzed, confirming the suitability of the smartphone biosensing platform for analysis of untreated complex biological matrices. The innovation of this cell-based and smartphone-based biosensing platform could be deployed as rapid screening tool for R&D activities of SME looking for new bioactive products and could help the small and medium enterprises not fully equipped with analytical laboratories for the first-level safety and efficacy tests which require expensive equipment. A valuable prescreening tool to select the best promising samples, e.g., pure molecules, active ingredients, food by-products, and vegetal extracts, is provided by the proposed approach, which prevents more specific and accurate analysis by external authorized laboratories. This first prescreening could reduce the number of samples to be sent to outsource analysis, and by providing real-time results, it could enable a continuous in-house management and tuning of procedures and protocols to obtain the most active products (Cevenini et al. 2016). The use of smartphones in this type of application is not only as a detector but also as a wireless control system for analysis with remote control of on-site detector. In the following work, Cevenini et al. proposed a cell-based mobile platform that exploits a newly developed bioluminescent yeast-estrogen screen (nanoYES) and a low-cost compact camera as light detector. Saccharomyces cerevisiae cells were genetically engineered with a yeast codon-optimized variant of NanoLuc luciferase (yNLucP) under the regulation of human estrogen receptor α activation (Fig. 2). Optimizing a new procedure that enables to produce alginate slices with good reproducibility, Cevenini et al. were able to prepare ready-to-use 3D-printed cartridges with immobilized cells. 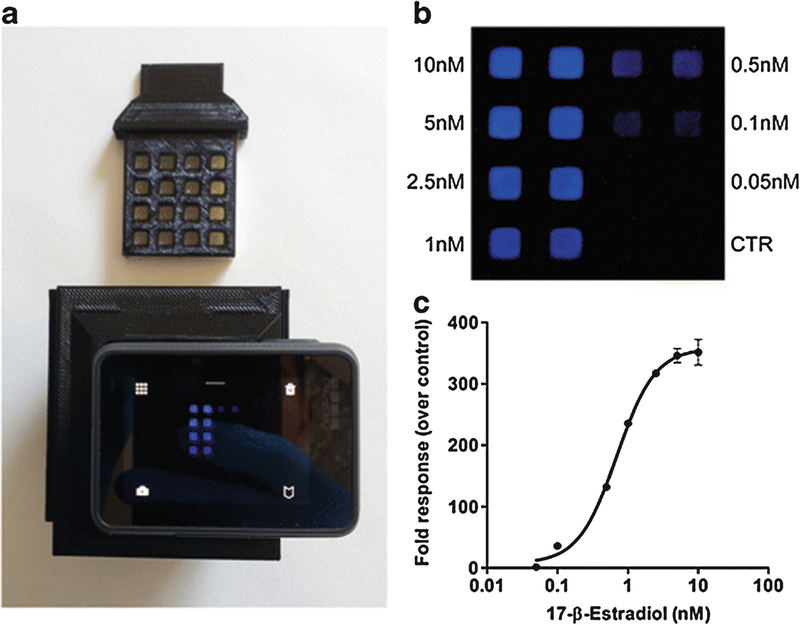 Moreover, they obtain a portable device exploiting a compact camera and wireless connectivity enabling a rapid and quantitative evaluation (1-h incubation at room temperature) of total estrogenic activity in small sample volumes (50 μL) with a LOD of 0.08 nM for 17β-estradiol. Since presence of chemicals with estrogenic activity in surface, groundwater, and drinking water poses serious concerns for potential threats to human health and aquatic life, the developed portable analytical platform has found application for the evaluation of water samples spiked with different chemicals known to have estrogen-like activity. Thanks to the high sensitivity of the newly developed yeast biosensor and the possibility to wireless connect the camera with any smartphone model, the developed configuration is more versatile than previously reported smartphone- based devices and could find application for on-site analysis of endocrine disruptors (Cevenini et al. 2018). To further improve predictivity and robustness of ready-to-use cartridge, 3D-cell culture models were also explored. In recent years, 3D-cell models have garnered great attention due to their capability to better mimic in vivo cellular responses to external stimuli. 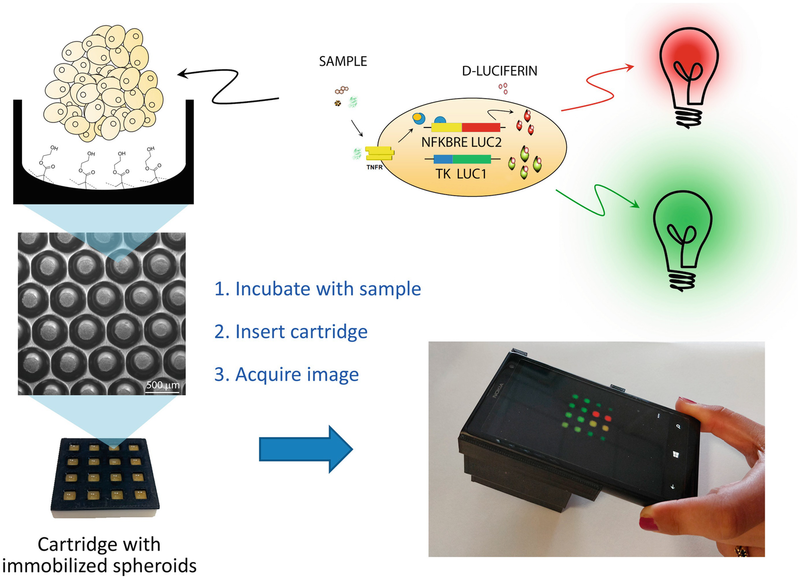 In order to obtain a predictive, sensitive, and robust yet low-cost 3D cell biosensor, a smartphone-based bioluminescent 3D cell biosensor platform for effect-based analysis was developed (Michelini et al. 2019). This biosensor exploited the nuclear factor-kappa B (NF-kB) signal transduction pathway which is induced by several types of stressors and is involved in the regulation of cell-cycle/growth, inflammation, apoptosis, and immunity (Fig. 3). Immobilized HEK293 spheroids genetically engineered with powerful red- and green-emitting luciferases were exploited as inflammation and viability reporters. The smartphone-based biosensor provides a limit of detection for tumor necrosis factor (TNFα) of 0.15 ± 0.05 ng/mL and could be a useful tool to initially screen environmental samples or other compounds on-site, especially for additional more accurate chemical analyses. In the last years, smartphone-based colorimetric biosensors have become quite popular thanks to their simplicity of use and low cost (Shen et al. 2012). Most of the reported applications use reflectance for measuring the generation of the color on a solid support while few applications use real colorimetric light absorption by a solution. One of the major disadvantages of this detection is related to quantitative information associated with a color change especially when there are slight changes in color, but the recent advanced computer techniques based on machine learning allow more accurate image processing (Kim et al. 2017). A system for label-free, noninvasive, and long-term monitoring of cell viability was developed by Su et al. The system is composed by cell viability biosensor (CVBS), an illumination provider, and a smartphone and was able to assess the effect of okadaic acid toxins on HepG2 cell line’s viability (Su et al. 2017). Cells, cultured previously in a 96-well plate, were treated with cell counting kit-8 (CCK-8). This kit contains a water-soluble tetrazolium salt WST-8 (i.e., 2-(2-methoxy-4-nitrophenyl)-3-(4-nitrophenyl)-5-(2,4-disulfonic acid) benzene-2 h-tetrazole monosodium salt) which is easily reduced by the dehydrogenase in the cell to a highly water-soluble yellow formazan. This product is produced proportionally to the number of living cells, and images can be simply acquired with the smartphone camera. More recently, Zhang et al. reported a simple, rapid, and sensitive colorimetric biosensors for the detection of Salmonella typhimurium pathogens by exploiting the multicolumn capillary for easy operation, the Fe-nanoclusters (FNCs) for signal amplification, and the smartphone app for image processing (Zhang et al. 2019). In particular, the proposed biosensor, showed in Fig. 4, consists of a multicolumn capillary in which the target bacteria were captured by magnetic nanoparticle column to form the MNP-bacteria complexes (magnetic bacteria) and then transferred into the FNCs column and conjugated with the FNCs to form the nanocluster bacteria. In the last column (HCl column), the nanocluster bacteria release the iron ions that react with potassium hexacyanoferrate to form the Prussian blue. The color changes were measured and analyzed using the hue-saturation-lightness color space-based smartphone app for quantitative determination of the target bacteria. Despite the proposed biosensor presents some limitations related to the volume of the samples not suitable for detecting pathogens in large volume and the fragility of the glass capillary, under optimal conditions shows a LOD of 14 CFU/mL. Electrochemical biosensors are widely used in several fields thanks to their potential reliability, portability, simplicity, and low cost, representing a promising tool for real-time and point-of-care (POCs) applications. Many smartphone-based electrochemical platforms exploit the smartphone for controlling, recording, and displaying electrochemical signals. Generally, smartphone is mainly used for receiving and analyzing the incoming data even if an external electrochemical sensor is always required (Eltzov et al. 2015). In fact, in contrast to optical techniques that are strongly influenced by the camera resolution, the focus and ambient light conditions, in electrochemistry, the measurements are independent of the smartphone’s capabilities. Amperometric systems comprise different detecting techniques (chronoamperometry, cyclic voltammetry, differential pulse voltammetry, and square wave voltammetry) basically based on changes in the current resulting from the reduction or oxidation of an electroactive species involved in a biochemical reaction between the working electrode and counter electrode, in which the current is proportional to the concentration of the target compounds (Grieshaber et al. 2008; Su et al. 2011). A smartphone-based electrochemical cell biosensor was reported by Aronoff-Spencer et al. in which yeast cells were genetically modified to express specific antigens to detect target antibodies (Aronoff-Spencer et al. 2016). These “cell factories” display hepatitis C virus core antigen linked to gold-binding peptide repeats to create dual-affinity biobricks capable of concomitant immobilization on gold-surface electrodes and antibody capture (Fig. 5). To perform cyclic voltammetry measurements, a smartphone-based potentiostat interfaced through the audio jack was developed by the same group. Despite the procedure results laborious, the device provided comparable performances to laboratory grade instruments showing a high LOD for actual physiological testing, but the system has not yet been validated with real samples. As proof of concept, Olivo et al. developed an amperometric sensor for real-time monitoring of glucose and lactate in cell cultures media (Olivo et al. 2014). Thanks to an Android application “BlueCells,” the sensor is connected via Bluetooth to the smartphone allowing to the user to define the measurement setup and select the species to be monitored directly on the device screen. Exploiting impedimetric measurement, a smartphone-based sensor was designed by Jiang et al. The authors reported a bacterial sensor based on electrical impedance spectroscopy wireless connected to a smartphone for real-time data transmission. The microfluidic system is designed to preconcentrate the bacteria, lowering the LOD to 10 bacterial cells per mL (Jiang et al. 2014). Thanks to the significant advancement of smartphone technologies, in the last years, there was an exponential growth of smartphone-based imaging applications related to cell-based disease diagnostics and cell identification (Liu et al. 2014; Skandarajah et al. 2014; Zhu et al. 2011). To this end, several mini-microscopes integrated into smartphones (Meng et al. 2016; Navruz et al. 2013), lens-free microscope (Tseng et al. 2010) and contact imaging systems (Lee and Yang 2014; Navruz et al. 2013) were developed for many mobile sensing applications. A rapid imaging method based on smartphone detection was developed by Cui et al. to quantify viable bacteria by single-cell microdroplet turbidity (Cui et al. 2018). Cells, previously encapsulated in nanoliter-scale droplets and cultivated on-chip for several hours, were acquired via smartphone-based optical detector. A customized app was used to process images and to determine the number of live bacteria, based on the increase in microdroplet turbidity as a consequence of bacterial proliferation. E. coli (G−) and B. subtilis (G+) samples were quantified via smartphone camera showing a LOD of 100 CFU/mL. Another interesting application of these smartphone-based imaging systems is related to detect cancer cells. In 2015, a smartphone-based imaging system was developed by Im et al. (2015) able to count cancer cells labelled with specific microbeads. Cells, placed on a glass slide for imaging, were imaged by the smartphone camera and the diffraction images analyzed by a cloud server that applied the Rayleigh–Sommerfeld diffraction principle. Exploiting this principle, microbead-labelled cells were identified and counted thanks to their transmittance and phase). The proposed platform was used for screening precancerous or cancerous cells in cervical specimens. An approach that involves the use of a smartphone for real-time quantification of cancer cells was developed by Amin et al. (2017). The authors suggested a 3D-printed smartphone-attachable continuous-flow magnetic focusing device able to separate and quantify in real-time different cell types based on their volumetric mass density, including cancer cells. The smartphone microscope provided a square capillary aligned to the smartphone camera and placed between two magnets with the same polar faces were placed oppositely. Cells images demonstrated the correct separation of different cancer cells from blood cells, providing a good separation distance about 100 μm. Nowadays, smartphone-based biosensors can be considered a valid alternative tool suitable in several fields especially rapid diagnostics, forensic, environmental, and food monitoring. Recent scientific advancements in chemistry, biotechnology, synthetic biology, and technological improvements enabled the development of several prototypes for rapid detection of living cells or for detecting signals emitted by cell biosensors. Despite very promising results, several issues remain to be solved before these devices may enter the market. Indeed, cells are not as robust as enzymes or antibodies, and the detection of weak signals challenges the sensitivity of smartphone-integrated CMOSs. Several research efforts are focused in this direction with the goal of providing new robust tools for point-of-care and point-of-need analysis. It is expected that 3D-cell models and robust microbial biosensors could be exploited for rapid on-site screening of environmental samples or toxic substances, thus providing a first-level screening for critical samples that require a more accurate analysis with conventional analytical techniques.